It was a huge year in entertainment for the USO. Here’s a look at some of the biggest celebrity experiences and shows we facilitated for troops and their families in 2014. They’re great examples of how – with your help – we make USO moments happen around the world for thousands of troops every day. Country star Hunter Hayes performed four USO shows in 2014, including late October and early November shows in New York City and Nashville, respectively, that helped the USO celebrate the anniversary of the Every Moment Counts campaign. Watch the video to see how Hayes created special moments for one Army family in particular during those shows. Meanwhile, NBC’s Al Roker made it his personal mission to entertain the troops and raise funds for the USO. He went on a USO tour to Afghanistan in early October with TV stars Jay Leno, Kevin Eubanks, Iliza Shlesinger and Craig Robinson. While that was a huge commitment, Roker topped himself by pulling off the #Rokerthon, a 34-hour Guinness World Record-setting weather forecast that was broadcast between Nov. 12-14 that benefitted the USO. Roker asked #Rokerthon viewers to visit the Crowdrise page he started to raise money for the USO during the broadcast. It’s not the holidays if the chairman isn’t on a USO tour. Chairman of the Joint Chiefs of Staff Army Gen. Martin E. Dempsey went on his fourth and final tour in December, bringing along country star and USO tour vet Kellie Pickler, USO tour vet and comedian Rob Riggle, “Glee” co-star Dianna Agron, “Suits” co-star Meghan Markle, former Chicago Bears linebacker Brian Urlacher and Washington Nationals pitcher Doug Fister. Speaking of Pickler, she and Aisha Tyler brought a sparkle to the USO Gala on Oct. 17 in Washington. See what they each had to say about why they support America’s troops. Universal Pictures teamed with the USO on “Unbroken,” a World War II story of heroism that is poised to be one of the biggest movies of the Christmas season. See how troops were treated to a red-carpet experience at the premiere of the Angelina Jolie-directed film. Longtime USO supporter Trace Adkins performed a special concert for troops on Fort Hood the first weekend in November, bringing up-and-comer Casey James with him. Broadway Star Idina Menzel – who became even more famous after her smash hit "Let It Go" from the movie "Frozen – joined the USO for a meet and greet with military families in November. The Sesame Street/USO Experience for Military Families entertained it’s 500,000th guest this year. The long-running USO entertainment tour has touched thousands of military families, including the the Curtises. Take a look. Rock and Roll Hall of Famers KISS talked to the USO about why they're raising awareness about veteran unemployment and why they donated some of the proceeds from their recent tour to the USO. Mr. Worldwide put on a USO show on the South Lawn of the White House for troops and families this past July 4. The Band Perry sat down with the USO before its USO Virginia Beach Patriotic Festival show to talk about entertaining troops and their families. 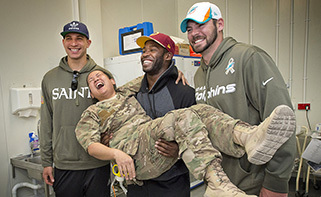 Washington Redskins receiver Pierre Garçon, New Orleans Saints tight end Jimmy Graham and Miami Dolphins punter Brandon Fields visited more than 1,800 troops in Afghanistan and the United Arab Emirates during a USO/NFL Tour in early March. Read what Garçon had to say about the trip. USO tour veteran Brantley Gilbert played a free concert for NASCAR fans and military members before the Coca-Cola 600 at Charlotte Motor Speedway, where the USO played a big role. Find out what he had to say backstage on Memorial Day Weekend to troops still serving in harms way. The crew from “How To Train Your Dragon 2” stopped by for a special USO screening at Joint Base McGuire-Dix-Lakehurst earlier this year. And finally, actor Bruce Willis took a moment to thank America’s troops for the holidays.